Bring your dad, bring your son, bring anybody to see Sergio Leone's A Fistful of Dollars, the first Spaghetti Western, and the film which started Clint Eastwood's rise to international stardom. 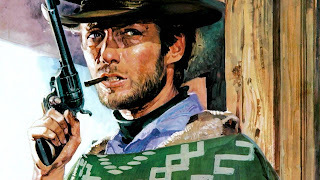 See Eastwood's "Man with No Name" ride into a corrupt village, and turn two warring gangs of outlaws against one another. This story was first told by Akira Kurosawa in Yojimbo only three years earlier, but Eastwood, Leone, and composer Ennio Morricone made the material their own. Westerns would never look or sound the same. Our showing is being sponsored by Mike Gillis of Raintree Pictures. Thanks, Mike.